The long-awaited merger of ELC and CELMA created the LightingEurope organization, which is dedicated to representing the interests of the European lighting industry and dealing with the innovations that LEDs generate. Two organizations in the European lighting industry, ELC and CELMA, will merge in Brussels on December 5, 2012 to form a new organization called LightingEurope. This new organization is known as the voice of the European lighting industry, it will represent many national lighting associations in Europe and various types of European lighting companies. ELC is the European Union of Light Bulb Manufacturers and CELMA is the European Lighting Association. In the future, LightingEurope will replace these two organizations. In the past few years, ELC and CELMA have been working closely together to unify the position of the European lighting industry. At the previous two Light Building exhibitions, they hosted the LED Legislation and Market Development Association. They also jointly participated in the European Lighting Technology Strategy Exhibition from 2010 to 2012. LightingEurope said that with the introduction of LED lighting, lighting technology and production methods have undergone unprecedented changes, LightingEurope will seize opportunities and meet challenges. While guiding the future of lighting in Europe and the world, the organization is also committed to becoming a platform for industry development and communication. The founding members of LightingEurope include eight of the current 12 ELC members, such as the familiar GE, HavellsSylvania, Osram, Philips and Toshiba, as well as Panasonic and Zumtobel. Many existing members of CELMA will also join LightingEurope. The Fine Seed Cleaner is an universal equipment well suited for pre- and fine-cleaning for differenty types grain and seeds.The Seed Cleaning Machine is European standard high quality equipment. It brings high cleaning effect. 1) Function: fine cleaning to remove impurities, broken and abortive grains; grading seeds accroding to sizes. 2) Application: cereal grains and seeds. 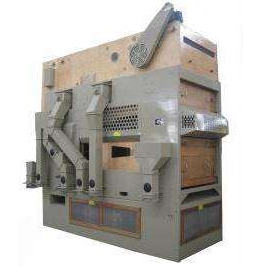 The screen boxes are made of wear resistant plywood, which is approved for food Screen cleaning with special rubber balls, screens are easy to change. cleaner has been developed specially for flexible, high quality cleaning for grains and seeds. It can be used for pre-cleaning and intensive cleaning, but mainly for seed cleaning.Durable surface of the machine owing to high-quality powder lacquering, We are the Fine Seed Cleaner Chinese supplier.